The El Formerly Known as Miyoshi: White stuff baby! Awww yeah! I'm going boarding tonight! Woo hoo! I am so psyched about this! Heading up with young Nate (other Nate, not AJET Nate for obvious reasons) after school, and, providing we can get his wee lender car up the mountain (had a crash the other week, the Suzuki is in the shop), we'll be whizzing down the hill by 6.30pm or so. Bring it on! 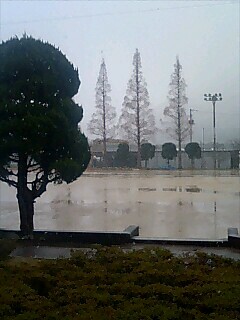 I have to go to elementary school like now, but I am reluctant to leave, as it is snowing something chronic outside. Here is a picture, but you really can't see how hard the snow is coming down. This is my sports ground at school. Normally the mountains are right there, but you can't see them today. Chilly! Cool! We also have a snowstorm going on right now! I'll try to take some pics tomorrow to show you... sounds like you would like it here - a LOT of snow! It has snowed every day this week, but the snow has yet to pile up and stay. It strikes me as really strange to sit at my desk and watch it snow all day, and then to note that the ground has stayed dry all day. Which is not to say I don't enjoy the snow. It's just that it borders on the miraculous, as far as my mind can reason.